This one’s real easy. After New Year’s Eve, we found that we had far too much in the way of the teriyaki meatballs I had made in my slow-cooker, so we froze half of them. Keep in mind that they are not great if you’re trying to watch your sugar intake. But hey, when you’re looking for a really fast meal and you have leftovers in the freezer, you use what you have on-hand! I won’t even hide this one behind a ‘read more’ link because it’s pretty short and sweet. In a small saucepan over a medium heat, saute red onions in the olive oil for a few minutes until softened. Add frozen meatballs and broth or water. Cook for a few minutes until meatballs are heated through. Allow to bubble away until sauce begins to thicken. Add half of the green onions and stir. Divide in half and serve over two portions of pasta, topping with the remainder of the green onions. 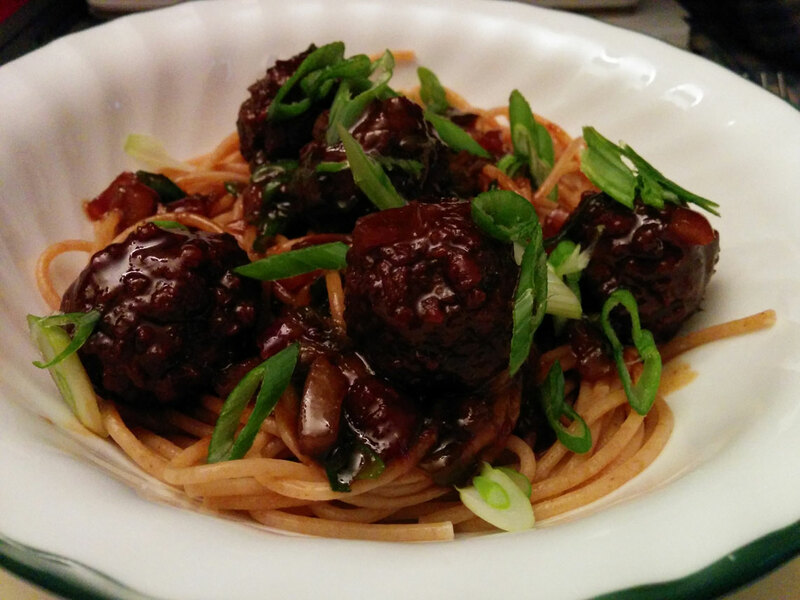 This entry was posted in comfort food, dinner, experiments, leftovers, quick meals, quick-and-easy, recipe, stove-top and tagged chicken broth, green onions, leftover teriyaki meatballs, onions, whole wheat pasta. Bookmark the permalink.